ECG Academy is taught by a Cardiac Electrophysiologist and award-winning educator. We are recognized as a worldwide leader in basic and advanced ECG training. TOP RATED by Online Reviews! Easy to understand, entertaining, high-definition video tutorials SHOW you what you need to know to read an ECG. Then learn how to approach complex unknown tracings with "how-to" ChalkTalk videos to gain confidence. It's like having private lessons with a heart rhythm specialist – so much easier than trying to learn from a book! The courses at ECG Academy teach a physiologic approach to analyzing ECGs, so you will understand WHY the ECG looks the way it does. We begin with the basics but you can achieve a higher level of proficiency than any other way. 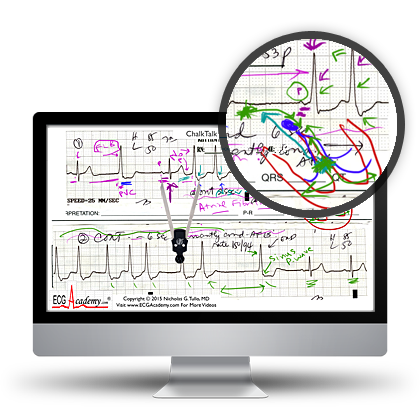 We cover complex topics in detail – you won't get that with "free" online ECG websites. Guaranteed to be the best course you will ever take! The new and improved Certificate Courses at ECG Academy award up to 20 Category 1 CMEs and CE contact hours to nurses, nurse practitioners, and now physician assistants! Our courses are now used by dozens of schools and thousands of healthcare professionals. 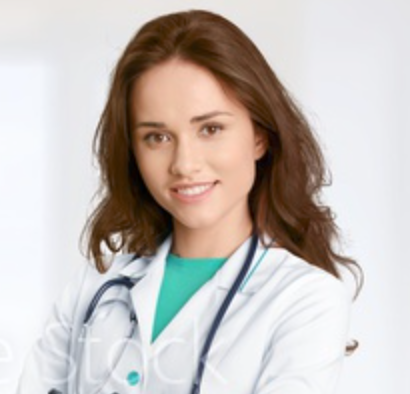 Many hospitals and corporations are using our tutorials to train their entire staff. THE BEST ECG COURSE OUT THERE! ECG Academy is the most comprehensive ECG program I’ve taken in 20 yrs as an ICU RN. These courses built upon and solidified the ECG skills I need now as a new NP. Top notch, high quality, very informative, educational, self-paced, hands on approach. Love the multiple short videos in each section. ECG Academy makes reading ECG’s fun! Highly recommended if you want the confidence and skills needed to understand and read ECG’s. I have been a subscriber of yours for a few years and have often referred fellow RNs to your site, telling them that your site is the Gold Standard to learn the ins and outs of the EKG. I have been an ER RN for several years now and recently transferred to the EP Lab. I ABSOLUTELY LOVE YOUR COURSE! watch an advanced video "ChalkTalk" now. 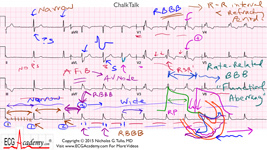 ChalkTalks are 5-6 minute lessons in approaching unknown ECG tracings. ECG Academy offers the most advanced ECG training available and every subscription includes access to a new ChalkTalk every week. Click on the video player at right and "maximize" the image by clicking the icon in the lower right corner of the video player. 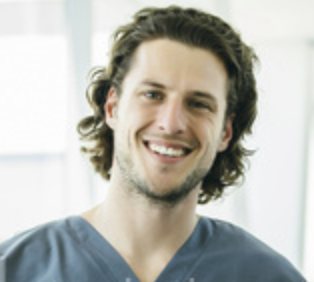 watch a Clinical LiveStream event featuring Dr. Nick on Saturdays at 10AM EST! This Clinical LiveStream discusses a young man who was in the habit of passing out in the shower! This was a serious case in which making the diagnosis wasn't just challenging... it was SCARY! Dr. Nick guides you through the latest techniques and guidelines for diagnosing syncope and discusses options for managing patients who pass out with little or no warning. 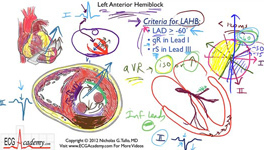 Clinical LiveStreams are accessible at all subscription levels on ECG Academy. Click on the video player at right and "maximize" the image. and friendly sense of humour, as well as a true ECG expert. You can’t beat the ECGAcademy.com for quality ECG education. If you are experienced, subscribe to our Advanced membership level for access to unique advanced video discussions, 40-minute arrhythmia workshops, and access to over 270 challenging Chalktalks. Video Lessons – Step By Step. Lesson videos build a foundation of knowledge from the bottom up, and important concepts are repeated to make sure you get it! We will show you how to diagnose basic and complex arrhythmias you may find on a rhythm strip. If your goal is to read 12-lead ECGs, our physiologic approach will explain WHY the ECG looks the way it does, which helps you to remember what to look for. Click here to watch a demo lesson. One unique part of ECG Academy are the weekly ChalkTalks, which are 6-minute video tutorials based on a real rhythm strip or 12-lead ECG. These practical "how-to" lessons help you gain confidence in applying your knowledge to an unknown tracing. If you already know the basics, ChalkTalks help you improve your skills. You will learn how to read complex ECGs that don't look like the ones in the textbook! Click here to watch a demo ChalkTalk. the physiologic approach to ECGs provided by ECG Academy provides you with the tools to interpret complex tracings. You can become a resource at your hospital, office or school. Plus, you can watch the videos and practical "ChalkTalk" videos on any device at any time. Access is provided through a monthly subscription, and you can cancel at any time. Try ECG Academy Now For FREE! You can have a FREE Introductory Membership so you can check out the videos for yourself! There are three hours of video tutorials included in this offer. You'll learn how ECG machines work, how to attach a patient, and how to measure basic ECG intervals. We also cover the anatomy and physiology of the heart and the cardiac conduction system. It provides a preview of the entire course. Once you finish the introductory videos, decide how far to go and select the membership level to join. If you need CE Contact Hours or CMEs, check out the Certificate Courses below. Certificate Courses award CE Contact Hours to RNs, NPs, and Physician Assistants. These courses were just upgraded, and include access to lessons and ChalkTalks, including a library of "Essential" how-to video tutorials. See below for more information and pricing. We offer a monthly and annual "ChalkTalks Only" plan for experienced ECG Readers who want a weekly challenge. ChalkTalks are like private ECG lessons with a cardiac electrophysiologist! See below to subscribe. Think You Aleady Know It All? Take our free ECG Pretest. It's based on the content that is included in the Level 1 (Arrhythmia) course. New Reduced Annual Pricing for 2019! Dr. Nick has something for every level of ECG learner. I think you’ll love his voice and teaching style as much as I do. ECG Academy Will Be exhibiting at the National Organization for Nurse Practitioner Faculty (NONPF) conference in Atlanta on April 4-6, 2019. Are Now Using ECG Academy! Learn how your school can use ECG Academy as part of their curriculum. We provide your students with state of the art training and give their career a headstart.